Wednesday the 8th was the toughest of the four days; blustery showers saw most anglers off the water early. 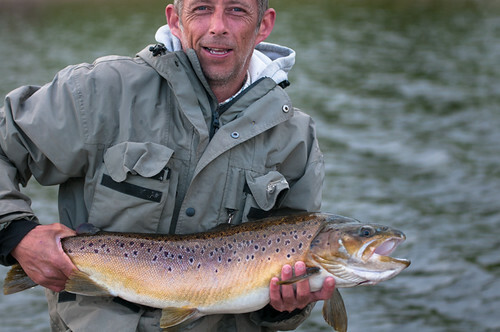 Fish were caught mainly to flies pulled back through the surface or on dries. Thursday belonged to Mark Wilson. Mark, who stayed for a couple of nights in our onsite apartment, hired a rod and line and ventured out to Hollins Point near the deeps. Mark fished a floating line with dries to take his first two fish then, as the sun increased in strength, he switched to a green pea on the point and Iain Barr’s candy buzzer on the dropper. He cast across the breeze and retrieved with a very slow figure of eight. Mark landed a total of fourteen fish. Good Angling Mark. On Friday Antoon Gysbers went to the same area and fished in similar fashion. There was a slight difference in the patterns used though. Antoon favoured a black and red cormorant on the point with a black and green crackton nymph on the middle with a pheasant tail on the top. Antoon landed eight rainbows to 3lbs over a short session before returning to the lodge for an egg butty. We only had a couple of bank anglers on Saturday, both of whom fished on half day tickets from Bell Point. David Jaques was the top rod with six trout. He used a floating line with a lures and his ever-trusty invicta pattern. We also held our annual dry lines competition on Saturday and fifteen anglers set out to try and become the 2018 champion. It was fished over two sessions. The two 3 ½ hour sessions were separated by a break for lunch and a beer and Jane put on another great spread that was really enjoyed by everyone. The conditions during the morning session were bright sunshine and a light breeze. This made for tricky fishing, as everyone was only allowed to fish a floating line. Derek Moore however bucked the trend coming in at lunchtime with five rainbows all of which fell to a black and green snake. Good angling Derek. The afternoon session was accompanied by some welcome cloud cover and not surprisingly more trout were caught across the board. Two anglers caught five fish over this session. The first was Bob Fitzpatrick who fished dries at the dam; he dropped another at the net as well. The second was Tim Barley who fished both Hollins and at the dam to get his fish. Over both the sessions two anglers caught six fish, they were, Bob Fitz and Derek Moore. Both anglers caught one fish in one session, which, in both cases, were the smallest individual fish of the session and both anglers caught five in their other session. This made for a close result. In the end Bob Fitzpatrick was crowned the 2018 champion and Derek after winning the morning session ended up in 5th place over all. This was unlucky on his part. Neil Heath took second spot, Tim Barley won the afternoon session and Bob Cooper won the biggest fish prize. (the full results are shown below) Well done everyone. This entry was posted in Stocks Reservoir Fishing Reports on August 12, 2018 by staff.